As already mentioned in my other blog posts, NetEye 4 is based on Icinga Web 2, a powerful PHP framework. During the development of some of our custom NetEye modules for Icinga Web 2, we needed to include some new, custom jQuery plugins to create a neat new effect in the GUI. For example, with the 4.2 release we introduced a multiselect component, switching from the basic HTML version to our new, easier to use and better looking one. Our custom multiselect box is based on a jQuery plugin called Multiselect (you can download it from https://crlcu.github.io/multiselect/). We then added some custom jQuery code and a customized theme to better integrate this component with our NetEye 4 look-and-feel. 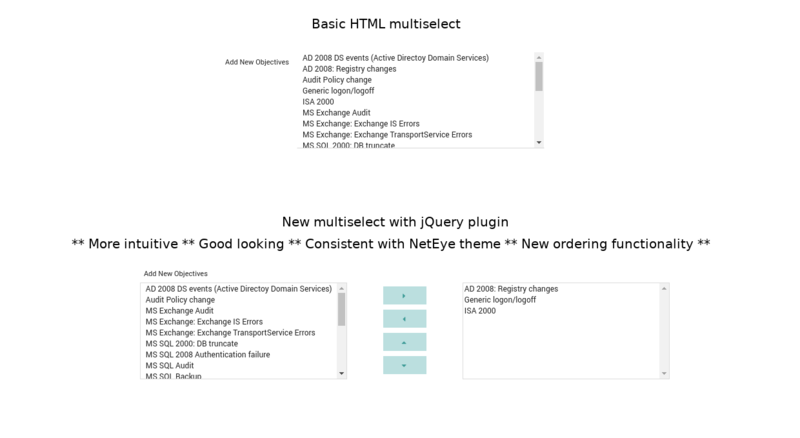 Our goal was to reuse the structure and style for each multiselect across the entire NetEye web interface. In other words, we also wanted to overwrite some Icinga Web 2 multiselects outside our custom modules. The jQuery libraries are automatically loaded in each section of Icinga Web 2, so the key point here was including a global CSS customization that would apply the desired style everywhere. A short guide that describes how to reproduce this style follows. In this way your theme will be used as the default for all modules and even for Icinga Web 2 itself.